Such a clever way to use leftovers...really! 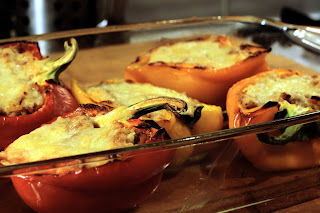 I think the best thing about stuffed peppers is the way the flavour infuses the stuffing. Like Darius says, good use of leftovers. We're trying to use up a years worth of storecupboard leftovers now and I have some mental things in my storecupboard. I can agree on the 'mental thing in storecupboard" sentiment.